Cobblers boss Keith Curle says Notts County’s ongoing struggles, both on and off the pitch, should be a lesson for football clubs up and down the land ahead of his return to Meadow Lane this weekend. Curle spent just under a year at the Magpies between 2012 and 2013, helping them finish narrowly outside the League One play-offs in his first season before he was sacked with the club 10th at the start of February the following season. The pressure for a footballer comes at the end of July when you’ve got no contract. At the moment they’re under contract and being paid and they’ve got to perform either to continue their journey here or potentially elsewhere. Challenging for promotion out of League One will now seem a lifetime ago to County fans given their side’s torrid campaign this season, with the club encountering major issues both on the pitch and behind the scenes. The Magpies have been stuck in the relegation zone since November and they are also due in court on 10 April after being issued a winding-up petition by HM Revenue and Customs, although owner John Hardy revealed this week that an offer to buy the club has been accepted. The visit of Northampton this weekend is therefore a crucial one for Neal Ardley’s side, and Cobblers boss Curle will be hoping to inflict more misery on his old club. “It’ll be a really difficult game,” said the Town manager. “They’re one of my former clubs so I know the infrastructure at the club and you can say it’s a club that hasn’t benefited from the financial investment that was put in place. “They had very healthy financial investment but if the fundamentals aren’t right within the footballing structure of the club, money doesn’t buy you success and that’s a lesson that lots and lots of people have seen previously. 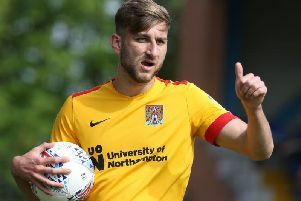 While the Cobblers have nothing tangible to play for over their six remaining fixtures, they should be eager to make amends for last Saturday’s hugely disappointing 2-1 defeat to Port Vale at Meadow Lane on Saturday, especially with players playing for their futures, either at Northampton or elsewhere. “The pressure for a footballer comes at the end of July when you’ve got no contract,” Curle added. “At the moment they’re under contract and being paid and they’ve got to perform either to continue their journey here or potentially elsewhere. “The players will be up for it this weekend. The preparation this week has been that everything is geared towards Saturday.